Jonna Lee shares the artful new visuals for her “gallant space disco” single. 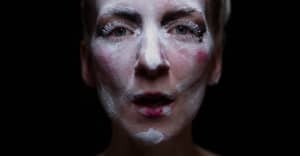 ionnalee is the solo project of Jonna Lee, who has spent the past decade making enigmatic and alluring pop music as part of iamamiwhoami. Currently going it alone, the Swedish artist released what she calls her first audiovisual single "SAMARITAN" in March. Today, June 2, her follow-up "NOT HUMAN" is premiering on The FADER. The insistent "NOT HUMAN" was co-written with Com Truise, with Lee producing. Its pounding rhythm provides the backdrop for a chorus in which Lee cries, "the urge is animal, I'm not human." Visually, meanwhile, the accompanying film is a quietly unsettling trip that sees Lee surrounded by cult-like figures dressed in white with masks hiding their faces. This is cut with scenes in which Lee is fighting these masked figures in woodlands. She also has her disco diva moment performing the song below a bright blue light. Check out the visuals above and read on for a Q+A with ionnalee. Can you explain the thinking behind ionnalee? This year is my 10th as a record releasing artist. The first two I spent fumbling about in the industry trying to find my place. The next 7 I spent making iamamiwhoami independently. And the past year, I’ve spent catching up with what I am beyond my collaborations, and looking at my full body of work in an larger perspective. Making room to grow as an artist but also as a producer, songwriter, and director. There’s a symbolic separation in the name with the “i” to mark pre and post iamamiwhoami, as it has heavily impacted my creative standpoint. What inspired the move into the audiovisual world? I've made audiovisuals since the beginning of my career in 2007, but then in shape of short cinematic videos with my collaborator Robin Kempe Bergman. We then began experimenting with taking our work further, and in different aspects working with our videos as a series of music films. With my solo work, it’s a matter of doing right by the vision of what I want to make. As I may not work in the same format as with iamamiwhoami, the music and visuals are still made as a unity. What was the thinking behind "NOT HUMAN" and its creation? The video takes place at a never ending celebration. There’s passion, contempt and a necessary battle. It’s part of a longer film in production, but it also stands on it’s own. And from what place does the music come? I refer to it as a tale of gallant space disco. It’s about finding the raw uncensored essence of the self and embodying that emotion. Which other artists working in the audiovisual world do you admire or look to for inspiration? [I'm] always trying insanely hard to not look over my shoulder. It'’s so easy to absorb impressions and all I breathe in comes out in my work. I’ve created a world of my own that I can feed off. I’m inspired by Sokurov, Villeneuve, David Lynch, Christopher Nolan. There are some artists that create their own worlds that I’m drawn in to like Natasha Khan, Röyksopp, and Björk. I’m currently on tour with Röyksopp throughout summer. We’ve found something extraordinary on stage together that is really inspiring. Between shows I am completing this piece of work I’m making. There will be more music, visuals, and concerts to come. And what is the situation with iamamiwhoami going forward? I don’t know. Me and Claes Björklund will see what the future brings. We’re always working together in different forms. He’s mixing my solo music, and I’m directing the visuals for his solo project Barbelle. We’ve made music together for 15 years so that won’t stop. But the format will be decided by what is right if and when the time comes.